Applications now being taken for the Artist-In-Residence program 2020-2021. Kinosaki International Arts Center is now taking applications for the Artist-In-Residence program 2020-2021. The application deadline is Sunday, June 9, 2019. Applications are now open for the 2020-2021 Artist-In-Residence program at Kinosaki International Arts Center (KIAC), a creative residence facility centered on the performing arts. KIAC is situated in Kinosaki Onsen, a hot spring town blessed with a 1300-year history. Kinosaki is located in Toyooka City, Hyogo Prefecture, which is well known for its rich natural environment and for having successfully reintroduced the Oriental White Stork back into the wild. KIAC is a facility where artists can concentrate on their creative activities. 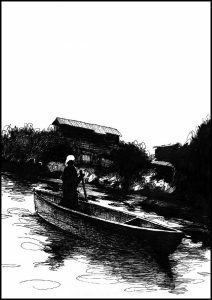 Since 2014, many artists have stayed here to create pieces of work that have then been spread both throughout Japan and overseas. Artist-in-Resident program select projects with the potential to excel in any of the following criteria: ≪Diffusibility≫, ≪Internationality≫, ≪Locality≫, ≪Innovativeness≫ and ≪Artistic Potential≫. In addition to spreading excellent art projects and activities in Toyooka/Kinosaki, artists are expected to meet the locals and tourists to create a place for new interactions. 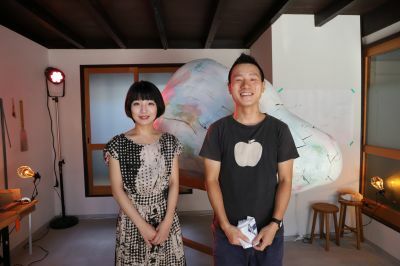 Dancer, writer, and poet Mika Masuda and sculptor Kei Bito participated as artists in the tour performance 『Kawalala-rhapsody』, a project sponsored by the Kinosaki International Arts Center in August. Today we wanted to sit down with them to have a chat about the process. Based on the short novel 『Kawalala-rhapsody』 written by Mika Masuda, who acts as a ghost writer for Mikako Saga, various artists including Bito created original pieces of art. Keep reading to learn more about these two artists and the inside scoop behind the collaborative efforts of how the city of Toyooka was transformed into a stage for their artwork. Applications now being taken for the Artist-In-Residence program 2019-2020. Kinosaki International Arts Center is now taking applications for the Artist-In-Residence program 2019-2020. The application deadline is Monday, June 4, 2018. Applications are now open for the 2019-2020 Artist-In-Residence program at Kinosaki International Arts Center (KIAC), a creative residence facility centered on the performing arts. Artist-in-Resident program select projects with the potential to excel in any of the following criteria: ≪Diffusibility≫, ≪Internationality≫, ≪Locality≫, ≪Innovativeness≫ and ≪Artistic Potential≫. In addition to spread excellent art projects or activities in Toyooka/Kinosaki, artists are expected to meet the locals and tourists, for creating a place of new interactions.